• View topic - Onigiri and the Real World. Onigiri and the Real World. We know the world of Onigiri Online is a mix of historical Japan and its mythologies. Kyoto for example, is a real city which you can visit in Japan, and many of the characters are based on historical figures. But how much of it is real and how much of it is fantasy? Most, if not all players on US server are not Japanese so we may not necessarily be able to tell the difference. This topic aims to share some of those information based on easily accessible stuff around the web. Hopefully we can enlighten ourselves and possibly further appreciate the work that went into creating this game’s contents. And who know, maybe we can organize an off kai or something in the future. https://www.youtube.com/watch?v=FTcHv_eURYE <-same video without the sound cuts. Re: Onigiri and the Real World. Just watched the video and it's very nice! I never gave much thought about the places we go through in the game, I'd always focus on the characters who I knew were based on historical figures or legends. That's ok, I'm glad someone else enjoys the videos as well. There is also significance as to why our first Kaguya's magatama creation quest is in Izumo, as the video explains. This time, in conjunction with the recent Gargoyle sisters update, we take a look at Sadoshima (Sado Island). In game story-wise, you will come across it after reaching Eichigo. Most will relate to it as a cold and snowy place. "I think the ogre (Oni) should be a hero figure that everyone wants to be" -Sadoshima resident. With the release of the Tohoku sisters redux and upcoming 2nd part event, we look at the history of the various types of mochi. Zunko and Kiritan came to Onigashima to spread the love of Zunda mochi, and eventually advocates anko mochi and other mochi as well. In the video, Zunda mochi is briefly shown with its sweet green soy bean paste. It also explains the reason why the square shaped mochi was created during the Edo period. I suppose there is a resemblence...? Hiraga Gennai as shown in Hoozuki no Reitetsu anime. 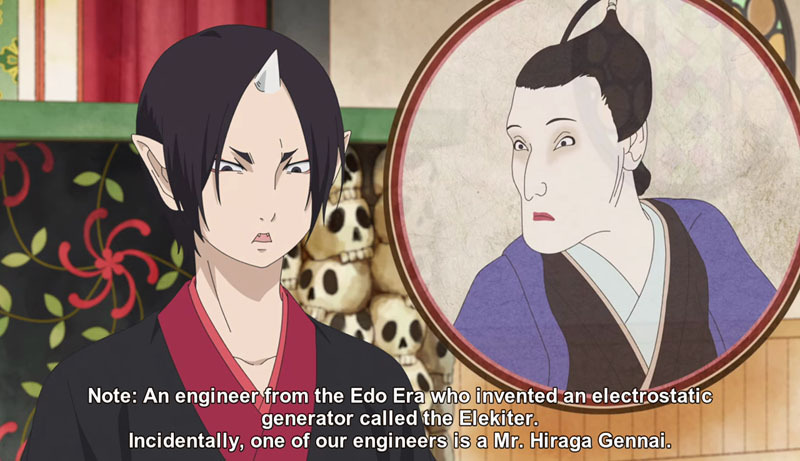 While Hiraga Gennai's career in real life was quite diversed, he is nowadays most widely known for the demonstration of his version of an electrostatic generator in 1776. This can be seen in multiple popular Japanese media, usually linking him to electricity/inventions/robots. Kamukui Hits Ferry Enroute Sadoshima? Players Attempting to Bypass Undersea Cave? NIIGATA - Eighty people were injured Saturday after a jetfoil ferry apparently hit a marine animal off Sado Island in the Sea of Japan, according to the Japan Coast Guard. Thirteen people sustained serious injuries, the coast guard said. The collision at around 12:15 p.m. did not prevent the jetfoil from reaching its destination on Sado Island, according to ferry operator Sado Steam Ship Co. A 15-cm crack was found at the stern. Coast guard officials are investigating the cause of the incident. The vessel may have hit a whale or some other creature, they said. The vessel, carrying 121 passengers and four crew, had left Niigata Port at 11:30 a.m. It arrived at Ryotsu Port at around 1:30 p.m. Crew members call on passengers to wear seat belts before departure as well as when the vessel is sailing, Sado Steam Ship said. The boat, propelled by a high pressure jet of seawater, operates at a speed of 80 kph, connecting Niigata and Ryotsu ports in about an hour. Its hydrofoil wings were also damaged in the collision. “After the sound of a bang … my throat hit the seat in front of me. People around me were moaning (because of pain),” one of the passengers told reporters.